Potter-Belmar Labs (Leslie Raymond & Jason Jay Stevens) presents "Mystery of Time," a live cinema performance that weaves concepts of human memory and perception, escape, and cosmological asymmetry through a projected mix of handcrafted video, field recordings, electronic soundscapes, and fleeting cameos of cultural flotsam and jetsam. The artists live-mix and manipulate beautiful homemade footage into a dreamlike narrative, rich with references to such diverse sources as the notorious Moody Scientific Institute, the Iraq War, Jorge Luis Borges, and Doris Day. 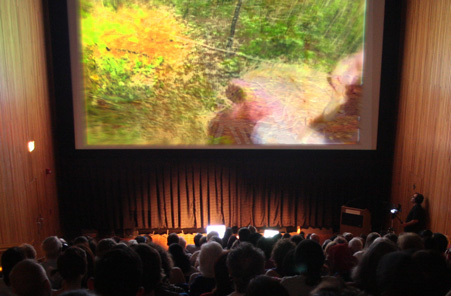 The artists have presented "Mystery of Time" at Chicago Filmmakers, the San Antonio Museum of Art as part of the exhibition, "Psychedelic: Optical and Visionary Art Since the 1960s," San Francisco's Other Cinema, and the LA Filmforum.